There are a number of different reasons why a tree may be structurally weak. One of the most common reasons is that the tree has co-dominant trunks. This is when a single base is supporting two large trunks. If the two trunks grow away from each other and form a U-shaped union, the tree may still be very stable. However, if the trunks grow close together and into each other, forming a V-shaped union, then the tree will have very serious stability problems. Over time, the trunks will begin to push against each other, and bark will form in the middle of the juncture, which is also called a V crotch. When the tree experiences heavy winds and extreme weather events, the V crotch may not be strong enough to support the two trunks which will move independently during a storm. This can lead to a severely damaged tree. There are also a few other ways a tree can be structurally weak, such as overextended limbs and weak anchors. Fortunately, there are ways to support co-dominant trunks and other structurally weak trees, so that they can better withstand storms and will have a longer lifespan. One of the most common ways to support co-dominant trunks and other structurally weak tree is by installing a cabling system to give the support to the trunks during extreme weather conditions. This will help the trunks move together and support one another when they are pushed by the wind. This can be very effective, and you will often notice after a strong storm or hurricane that the trees that had cabling systems were more likely to survive. In the past, these cabling systems were created by wrapping wires around the trunks in an effort to tie them closer together. This method has stopped being used because it prevents the trunks from growing and damages a tree’s vascular system. Less restrictive metal cables are now used instead for mature trees. These cables provide strong support and are very durable. However, metal cables are not used on younger trees, because the trees can become reliant on the support and develop less supporting wood than they would naturally. For younger trees with V-crotches, more flexible materials are used for the cabling. The cables will be configured and installed based on the specific size and dimension of the tree. Some common cabling systems include direct, triangular, hub-and-spoke, and box configurations. An even more effective way to help structurally weak trees is to treat the problem early. With attentive and early pruning, co-dominant trunks can be recognized and removed. If this problem isn’t addressed at an early stage, it will become impossible to remove one of the leaders without threatening the entire tree, and so you will have to resort to cabling and other methods. Some arborists who are caring for co-dominant trunks will use brace rods to keep the two trunks from growing too far apart. The rods are bolted onto the trunks to help guide their growth pattern and keep them from growing sideways. This can be a good option when it’s too late to remove one of the leaders, but the tree is still relatively young. If you are worried about the structural strength of a tree, you should get in touch with certified arborist. 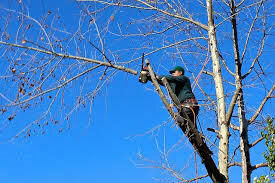 He or she can examine the tree and provide solutions to make the tree less likely to fail. If you have a tree that already is using support systems. You should have arborists inspect the systems every couple years and also after severe storms.